This is a new type Wireless Door Window Safety Contact Magnetic Security Alarm.keep yourself&your property safety. Widely used in home,shopping malls and so on.Placed on the doors and windows. KERUI is a professional security supplies supplier,like door window alarm,security alarm,focus on strong quality security products design,research and development more than 17 years.We are responsible for security,Only for you to enjoy a security life. Free lifetime technical support and 1 years manufacturer's warranty. 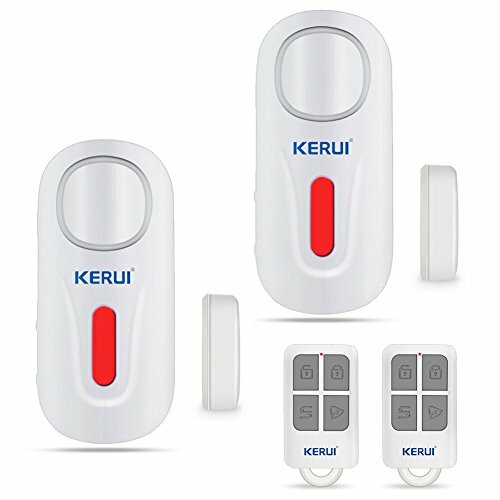 Home Security System:KERUI magnetic DIY sensor alarm loud volume up to 120dB,lasts two minutes,Strong Anti-theft material,perfect for home front door,sliding door,shop and more.Even elderly can hear the alarm. Remote Control:Different from other wireless door window sensor burglar alarms,KERUI D2 entrance alarm system equipped with remote controller at the factory,you can arm/disarm by remote,Simpler than manual operation door alert. Smart Humanization:2 mode for you,Not only as a open door alert system but also as a wireless doorbell,Daytime as a doorbell,Turn on alarm mode at night;A remote control can be paired with up to 20 alarm host,and one alarm host can also use with 20 remotes,A remote control can close multiple alarms,Otherwise you can. Easily Install:Open the back cover,Install the batteries or unplug the button battery plastic piece.Paste alarm and magnetic strip to the right position on the door or window.it will alarm when the distance between then more than one centimeters. If you have any questions about this product by GRANEYWELL, contact us by completing and submitting the form below. If you are looking for a specif part number, please include it with your message.